As with many aspiring CPAs, my career goal had been to take on the challenge of becoming CEO at a company. I had a number of opportunities throughout my career as a CFO to achieve that goal. Since most of those opportunities were “turn around” situations, each required complete commitment and devotion to the task at hand, which was to save the company. However, as a life-long learner, I was my own worst enemy. Invariably, in five to seven years, the challenge and the opportunity to learn new things diminished, and I felt an “itch” for the next challenge. That itch brought me to Andesa Services in 2005 as CFO. In the case of Andesa, there was no “save the company” urgency. Andesa was a stable, 22-year-old, privately held provider of technology and services to the life insurance industry. Predictably, after five successful fiscal years, the same career decision point loomed in the back of my mind. Time to move on? Unexpectedly, in December 2010, I was offered the opportunity to lead this extraordinary company as CEO. There was a moment when I believed I had reached the pinnacle of my career. My career aspiration had been achieved! That exuberance was short lived. In the same Board meeting where I was offered the opportunity to be CEO, management informed the Board that the company’s largest client had announced its exit from the market and would no longer offer the insurance products administered by Andesa. This announcement was a tidal wave that put significant revenue at risk. So much for basking in the glow of a career milestone. At that meeting, Andesa’s Board deferred approval of a budget to allow management time to assess the situation and financial impact as well as prepare a plan for a reduction in force. In one meeting, my mental state descended from the mountain top into the valley of reality and reaction. For Andesa to maintain its long-term, Evergreen perspective, there was no choice for the organization but to make short-term decisions and operate in turnaround mode until we had weathered this storm. For only the second time in the company’s history, performance and projections led us down a path that contradicted our People First culture. I was keenly aware that culture can collapse quickly, especially when profitability strains the ability to invest in a healthy environment. Self-consciously, I questioned my own leadership talents. Could I lead my Andesa teammates through this difficult period to a brighter, long-term future? It was baptism by fire. I knew my first conversation with the employee team would set the tone for our future together. I began that initial team meeting by expressing appreciation for our exiting CEO and wishing him future success. I acknowledged the confidence that the Board had placed in me, and I shared how those conversations had been some of the most affirming discussions in my life. I then quickly pivoted the conversation with the following statement: “But this isn’t about me—this is about Andesa Services.” I went on to highlight excerpts from Good-to-Great highlighting the discipline needed to confront challenge. I emphasized our strengths, not our fears: our fiscal soundness; our reputation for service excellence; a strong technical environment that requires constant modernization investment; and, an ethical work environment made vibrant by a set of core values lived by our teammates. I asked each teammate to look at the faces of their colleagues around the room that day, to recognize that this group of individuals is the best in the world at understanding, processing, and administering complex life insurance products and policies. Despite my best intentions to inspire, the reality of the situation was still brutal. Layoffs were emotional and difficult. Many team members questioned the organization’s culture and financial stability. In the ensuing months, we witnessed the departure of many talented individuals. But, those who remained stayed focused on their work and never wavered in our commitments to our clients. They preserved the Andesa culture by supporting one another through a difficult time. Three things sustained me through this transition. First, I believed: I had a deeply rooted trust and confidence in the people of Andesa Services, and the number one goal during this time was to ensure we preserved our core values and culture which had led to 27 years of growth and success. A reduction-in-force cut to the heart of our vision and sense of community, and I made constant reminders to myself and the team that who we are was significant. Second, I called on my faith: My journal from those days is filled with prayer requests—some answers were clear, and some requests were answered in ways I have yet to comprehend. Remaining grounded in my faith during those trying days was paramount for staying positive and confident we would persevere. Finally, I focused on nuggets of good news: Small daily wins dominate my journal. Sometimes a staff member shared a positive comment—the progress on a project or a hint of possible new business opportunity was enough to provide encouragement. Those daily moments reinforced my faith that we would prevail despite simultaneous daily doses of brutal reality. Today, Andesa is a financially stable, privately held, 35-year-old company that is partially ESOP owned. We are investing in new technologies, product lines, and service offerings. We are marching toward becoming a 100 percent ESOP-owned company. Our existing clients continue to add new products each year, and we are adding new clients to our insurance administration eco-system. The journey for an Evergreen company involves some wonderful views from the peaks, but it also requires endurance through the valleys. The long journey to “Forever” is rarely (if ever) straight and paved. Andesa’s ability to persevere provides us the opportunity to live into our Forever Vision. The lessons learned from those first days in the leadership seat continue to drive me today. In corporate communications, we are always careful to share the reality of our situation and to emphasize our strengths and the prospect of a positive future. Most of our message focuses on our culture, purpose, and the resolve of the Andesa spirit and its team members. And, by the way, I learn something new from my teammates every day. My “itch” seems to have been cured. 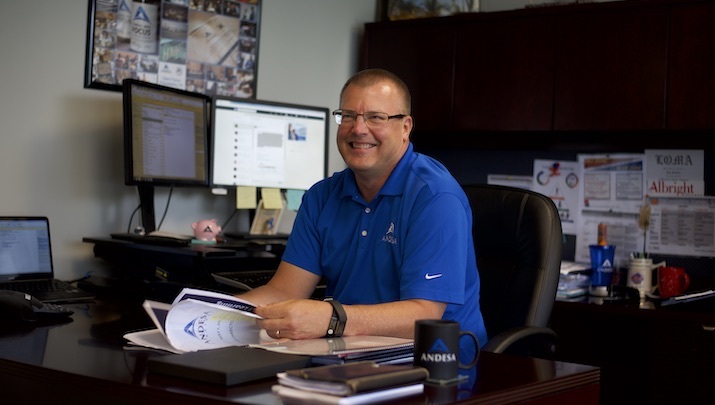 Ron Scheese is President and CEO of Andesa Services.